On Friday night the Braves introduced their newest part of their fan experience - the 40ft. Chick-Fil-A Tomahawk Chop Cow. The cow marks a new breakthrough in creative stadium branding, as it justifies how teams and brands alike are working towards creating initiatives that enhance the overall game experience for fans. With the introduction of the 40-foot cow, which features a "Du The Chop Eat The Chikin" sign, Chick-Fil-A continues to serve as "creative branding" leader in the sports landscape, after introducing the "Eat Mor Fowl Poles" in Houston in 2006. 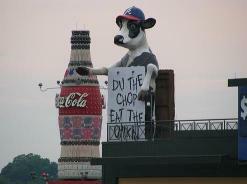 If corporate partners always remember that their end goal should be to "enhance" rather than "interrupt" consumers when implementing ideas, they will receive similar positive fan acceptance and buzz as the Chick-Fil-A cow has received at Turner Field in Atlanta. MLS - Hire This Guy!